The L80 lifetime rating is 50,000 hours, which equates to over 19 years in a typical 10 hr per day, 5 days per week office environment. 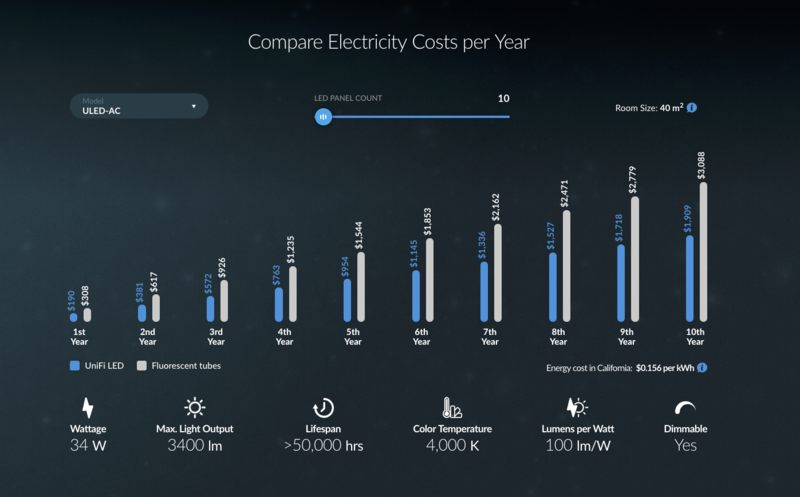 Over a 10 year period, 100 ULED-AC panels can save up top $10,000 in electricity costs. ULED-AC is 2′ x 2’ (602 x 602mm), which will fit most lowered ceilings. The UDIM-AC Dimmer Switch controls one or more ULED-AC panels and eliminates the need to install AC wires from the light switch to light panels on the ceiling. Users can program each Dimmer Switch for each group of panels connected with it. Control principles are also alterable with no wiring changes. Due to the fact that LED panels are low-energy, users may use standard wiring for daisy-chaining. This minimizes future AC wiring work for upgrades or new installations. If users also want to use Ethernet for lighting control instead of Wi-Fi, that is no issue. Panels can be interconnected with daisy-chained Ethernet. 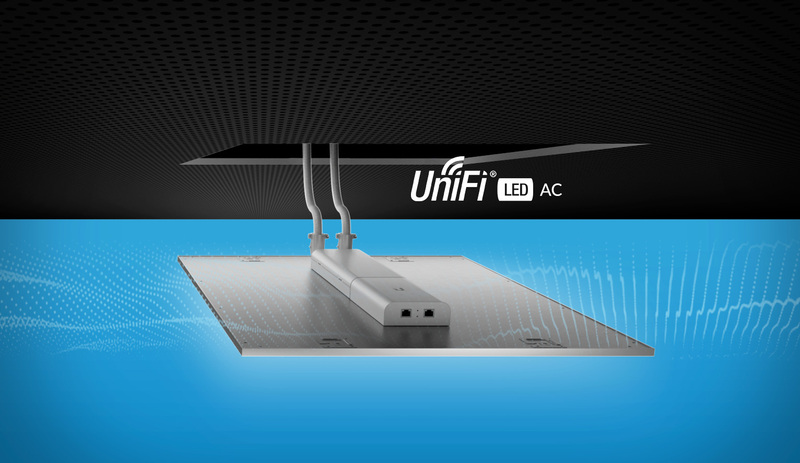 UniFi lighting is flexible and easy to integrate into the rest of the network. If users prefer using Ethernet-connected UDIM-AT Dimmer Switches with ULED-AC panels in some areas, that works! Users can mix and match all UniFi lighting products and program the whole system with the UniFi LED Controller. DesignLight Consortium (DLC) is a non-profit organization, pushing for the adoption of high-performing commercial lighting solutions. DLC creates and maintains technical specifications and provides certifications for high-efficiency lighting systems. DLC-certified products are eligible for government rebates in the US and Canada. Ubiquiti is pleased to announce DLC Certification for our ULED-AC product. DLC certification provides the best rebate options from utilities, making your LED lighting investment payback time even quicker. To see more on ULED-AC panels and UDIM-AC Dimmer Switches, go to the ULED product page. Visit our online store to buy UniFi LED panels and dimmers.